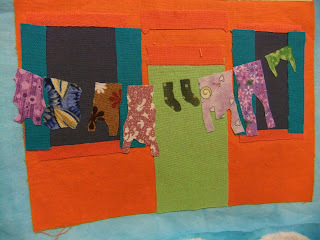 Went to a Gillian Travis workshop at the weekend - based on her Washday Blues quilt, we all did a house each. ('We' being the Embroiderers Guild Halifax Branch). A highly recommended tutor - try get on one of her workshops if you can - she also teaches in Europe. The workshop was entitled Burano Houses and these are in Venice. I changed the design of mine slightly and put a little black cat in the upstairs window. 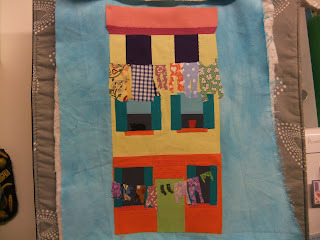 Here's a close up of the upstairs washing - just needs stitching now - everything is stuck down. This is the washing downstairs. The washing was drawn onto Heat n Bond - it's a bit like Bondaweb, but it has a paper backing not a greaseproof type and therefore the sticky bit stays stuck to the paper until you want to take it off. Not sure where to buy in England, I bought it in America. 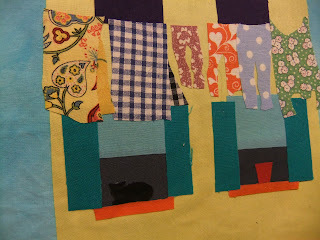 Then it is ironed onto the fabric and then the shapes are cut out. Have fun! Davina.